World 2-4 is the fourth course of World 2 in Super Mario 3D Land. 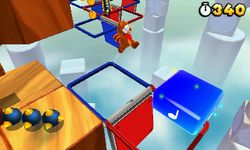 The level starts in a small site made of wood cubes and introduces Red-Blue Panels. The icon is a pair of Red-Blue Panels with trees surrounding them. In the first area, a Red-Blue Panel is used to reach in the next area. After more wood cubes, Mario will find more Red-Blue Panels and Stingbies. Ahead, he must cross more Red-Blue Panels, but now with Baddie Boxes that release Goombas, spiked cubes and rotating Spike Bars. In one of these platforms, there is a Super Note Block. Near, Mario will face some rotating spiked bars above more platforms and another enemy box and a Stingby. Now, next to the Goal Pole, he can use one Red-Blue Panel to grab the top. Star Medal 1: In the first section with enemy boxes, the Star Medal is floating behind some spiked blocks. Star Medal 2: Soon after this section, Mario will find a Super Note Block that will send him to a Coin Heaven. In the end of the area, a Star Medal can be collected. Star Medal 3: In the next Red-Blue Platforms area, Mario will find a Flying ? Block. Jumping over it is sufficient to grab a Star Medal in the midair.